Iain and Ned enjoying the snow, winter 2015. Now the days are (a lot) shorter and the temperature is dropping we have been giving the boys a little more TLC to help them through the winter months. This includes a wee bit more Alpaca feed (full of extra vitamins and minerals) and some yummy hay to supplement the dwindling grass (although as I write this the grass is still growing and we are having a wee mild spell on the Solway Coast!). 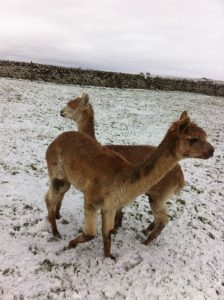 Alpacas are of course designed to deal very well with the cold and so take winter in their stride! 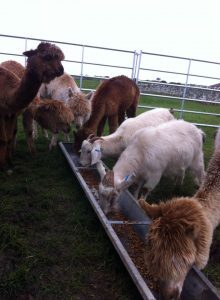 We have also had a few additions to the alpaca paddock in the last day…four nanny goats. For those of you planning to visit us next spring/summer we should have a few kids to say hello to (and know doubt feed!) as we get ready for a trek. We have yet to name our four friendly nanny goats, so if you’v any suggestions then please give us a shout via our Facebook page (https://www.facebook.com/SenwickAlpacas/) which is also where you can keep up-to-date with various goings on around the farm!